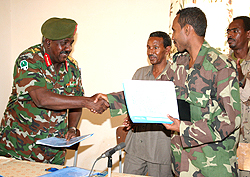 Tessenei, 03 July 2006 – The Sudanese government and East Sudan Front signed here a document on action program regarding the signing of security and military agreements on June 27. This move was in continuation of the Agreement on Declaration of Principles that was reached between the Sudanese government and the East Sudan Front on June 19 in Asmara under the care of the Eritrean government, in a bid to implement the cessation of hostilities. 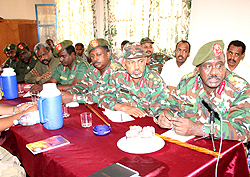 Representatives of both sides and the Eritrean government were present at the signing ceremony. 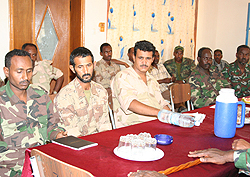 The new agreement on cessation of hostilities obliges the two sides to desist from any movement from the places they had occupied prior to June 19, designate army officers who would implement the agreement drawn from both of them and representatives of the Eritrean government in five stations that separates the two parties. This is to say the area around the Red Sea, Setit river, Barka river, Kerayit and Lafa towards facilitating the implementation of the peace process and stability of Sudan. 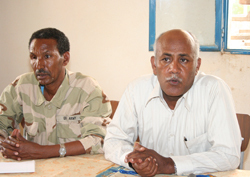 On the Eritrean side, the Head of Organizational Affairs at the PFDJ, Mr. Abdalla Jabir, and the Commander of Operation Zone 1, Brig. 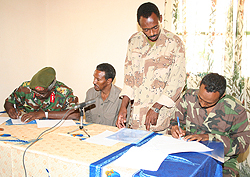 General Tekle Kiflai, and on the Sudanese government side, General Hassan Mohammed Al-Amin and Mr. Mussa Osman Issa from the East Sudan Front signed the agreement. Meanwhile, the East Sudan Front is holding a three-day congress starting July 2 in Tessenei town on the implementation of the Agreement on Declaration of Principles and cessation of hostilities. Copyright 2001 - 2006 © shabait.com . All rights reserved.